I love caramel. In any form. And these caramel clusters from my childhood are delicious. Soft and chewy with a little crunch. And they are so easy to make. Only 4 ingredients! The hardest part is not eating the caramels as you unwrap them. I have never accomplished that, so I dare you to try. 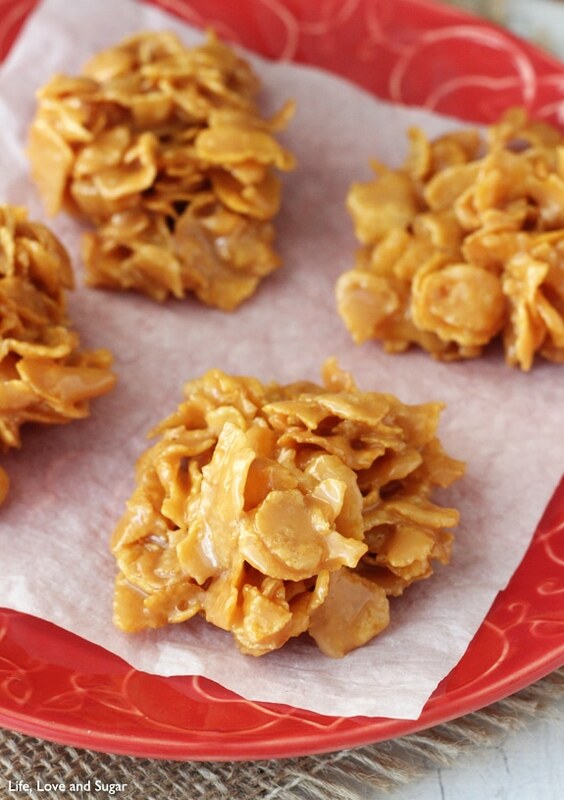 These babies are pretty popular in our family because we are pretty much all caramel lovers. They certainly don’t last long. I hope you find them as irresistible as we do! NOTE: This recipe has been updated so that the cookies are less sticky, as some have noted. 1. Put milk, butter and caramels into a large pot (large enough to have up to 6 cups of cornflakes in it and still be able to stir it easily) on about medium heat. Allow everything to melt, stirring often so that the mixture doesn’t boil. 2. When the caramel is melted down and everything is well mixed, add the cornflakes. Mix well so that the flakes are all well coated. 3. 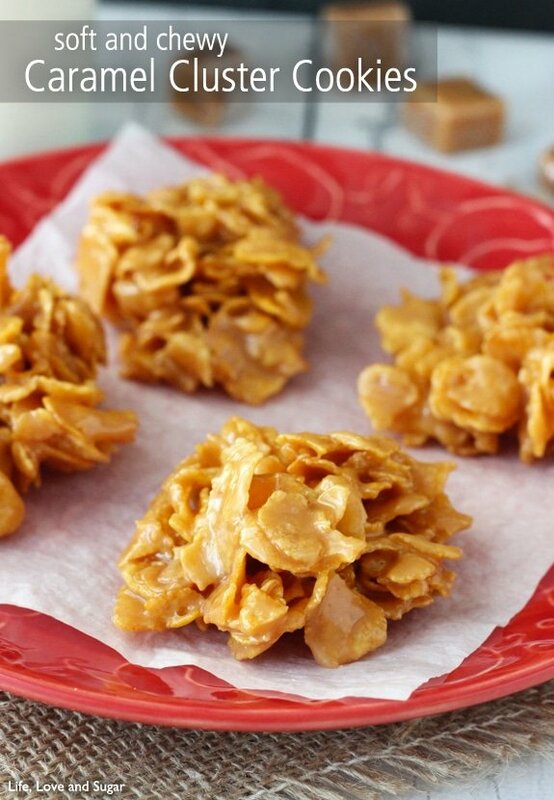 Scoop out spoonfuls of cornflakes onto parchment paper, or other nonstick paper. 4. Allow to cool fully. As they cool, they will harden into more of a cookie. Wasn’t that easy! And soooo yummy! 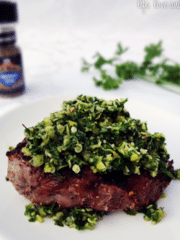 Not Your Usual Chimichurri, but Better! Do the caramels have to be Kraft? I just made a batch using generic caramels and they seem to be sticky still. Any tips? Hmmm, I’m not sure. I’ve only ever used the Kraft ones. I wouldn’t think that should make a difference though. In general, these are kind of sticky but get less so as they sit and harden. I don’t think caramel sauce would work. 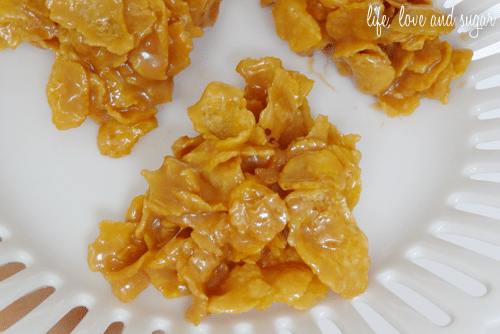 The caramel mixture dries to make the clusters but I don’t think it would dry if you use caramel sauce, which is more liquid like than the caramel candies. Just made these to go w a coffee tasting I’m doing at my work, Starbucks! So simple and so good! I used generic caramels I found at Target. Worked great! I’m so glad you liked them Ashley! These seriously are a classic for me – LOVE them! Do you ever use a frosted flakes cereal? 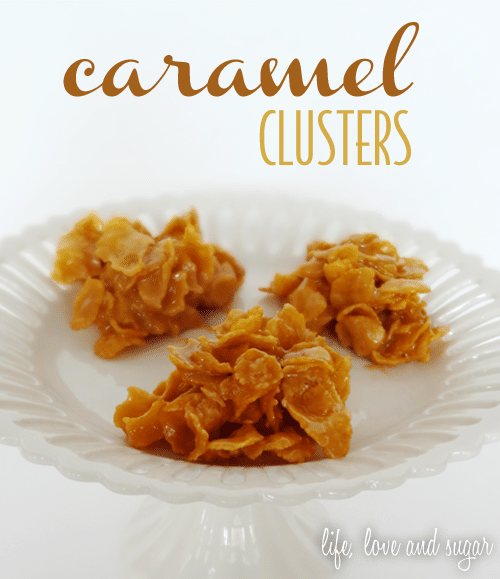 I’m going to make them for my husband, he is a great caramel fan. Yes, I have! They work great too. Can you give me an idea of how many caramels this would be? I have some loose at home but no scale to measure them on. Thanks. Thanks for this! My mother used to make these when I was a kid (a loooooong time ago) as part of our Christmas cookie assortment. I had all her recipe cards after she passed away, but then they got destroyed in a fire (I know, it should be a Lifetime movie). I am a terrible baker, so it’s nice to have some kind of “cookie” I can make! I’m so glad you’re able to make these cookies again Colette! I hope you enjoy them! How long are these good for? How would you suggest to store them? They can actually last quite a while because they’re mostly caramel and cornflakes. I’d say at least a week should deb fine when stored in an airtight container. Have you ever used oats instead of the cornflakes? I haven’t. You’d probably need a good bit more oats and they’d be an even softer and chewier cookie than the cornflakes. gona make these and dip some in chocolate! Is there a special trick to keep them from staying sticky? Mine were delicious, ( sprinkled flaky sea salt on them???? ), but never firmed up enough to not stick to each other on the cookie platter. I refrigerated them, and they firmed up but after returning to room temp were sticky again. Not really. I honestly don’t have that problem. I mean yes, they are covered in caramel so they naturally have a bit of stickiness, but they shouldn’t be an issue. It’s really just a balance of the caramel mixture to the coconut. I’m planning on making these this weekend. Have you ever tried freezing them? I bought a container of these at a grocery store before Christmas. My family loved them. Of course they had sold out when I returned to the store for more. I grew up with the chocolate & oatmeal no bake cookies, but your recipe is exactly what I’ve been searching for! They are absolutely delicious. 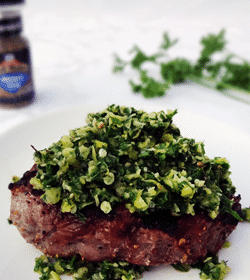 A light sprinkle of sea salt on top before they completely set up is that ‘sweet & salty’ taste we all love! Thanks for sharing, Lindsay! 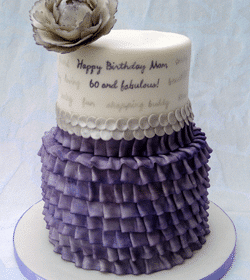 My Mom is 60 and Fabulous!